Daimler to test self-driving trucks in Nev.
Daimler board member Wolfgang Bernhard says autonomous trucks are likely to hit the roads first, partly because more trucks operate "in a less complicated traffic environment" out on the open road, while passenger cars spend more time in urban areas. LAS VEGAS (Reuters) -- Daimler AG has been granted a license by Nevada to test self-driving trucks on public roads, as the U.S. and Europe race to establish a regulatory framework for autonomous vehicles. 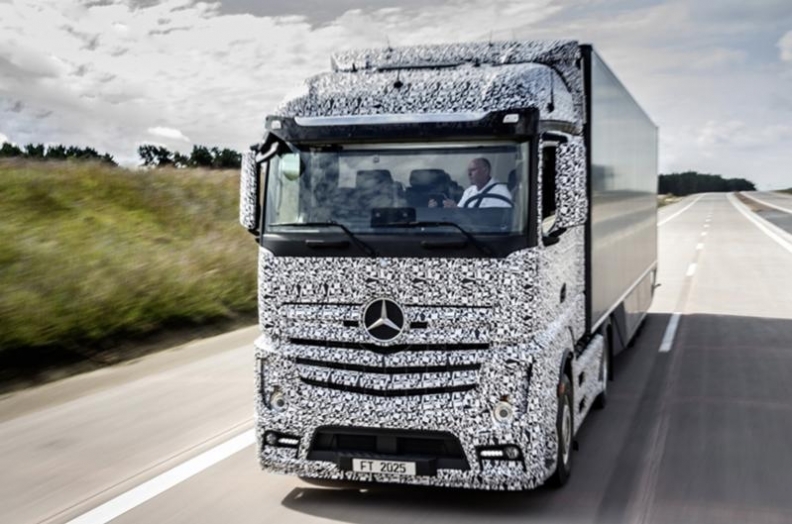 While companies such as Google have dominated the headlines with advances in driverless cars, Daimler board member Wolfgang Bernhard told reporters autonomous trucks were likely to hit the roads first. That is partly because more trucks operate "in a less complicated traffic environment" out on the open road, while passenger cars spend more time in urban areas, he said. Truck operators also have a big financial incentive to adopt the technology, as it would bring savings in wages and fuel. "It makes the most sense to them," Bernard said in Las Vegas on Tuesday. "These guys have to make money." Despite making significant progress with the technology, automakers face a battle to bring their advance prototype vehicles to market in Europe and the U.S. due to regulatory hurdles and questions about product liability. The "tipping point" to commercial viability of autonomous trucks will be reached when enough U.S. States allow them on their roads to make interstate commerce viable, Bernhard said. "We need more than (a few states) and it will take some time," he said. Bernhard said no customers had yet made a commitment to buying Daimler's self-driving trucks. "We think once the legislation is there and once the regulatory environment is there, we'll be approached by customers," he said. "We're not at that point yet." Europe too is working on establishing test routes for autonomous trucks, although it will take time before freight companies can cross the continent with such vehicles. "I think ... the regulatory environment can be done in the next five years," in Europe, Bernhard said. One of the challenges for autonomous driving proponents is meeting safety concerns while persuading lawmakers that accident liability can still be established. Questions over who is in charge of a vehicle require trucks to have a driver present, even while it operates in self-driving mode. Bernhard said other U.S. states -- California, Arizona, Michigan -- had shown an interest in self-driving trucks, but more states would need to get on board before the federal government took up the issue. Separately, Bernhard declined to comment on reports that Daimler's Mercedes-Benz is preparing a bid for Nokia's Here mapping unit in a consortium with BMW AG , Audi AG and Baidu Inc.